All fashion drawings consist of lines, curves, and geometric shapes. Figuring out how to draw smooth, flowing lines and shapes that vary from dark to light, thick to thin, and bold to subtle isn’t always easy. Fortunately, practice really does make perfect, so the more you draw, the better you get and the more comfortable you become with varying your technique. If you’re a lefty, put a piece of paper towel under your hand as you draw. Lefties tend to drag their hands across the paper when they draw, making it more likely that they’ll smudge their work. You can reduce almost everything you draw into a collection of circles, ovals, squares, rectangles, trapezoids, triangles, and heart shapes. After you master the basic shapes, putting them together into a figure drawing becomes much easier. Ovals, squares, and circles are essential for outlining the shape of the head. The oval shape also helps you establish the fashion head count, which helps you figure out body proportions. As for triangles and the rest? You use them for patterns, for facial shapes, to exaggerate parts of the body, and for so much more. Draw basic shapes — circles, ovals, squares, rectangles, trapezoids, heart shapes — until you’re comfortable with them. Experiment with the space between the shapes by connecting and stacking shapes in different ways. To play around with shapes, have lots of cheap paper handy and don’t worry too much about the finished results. The important point is to relax and practice, practice, practice. What’s the big deal about drawing a long, straight line? A lot! First of all, a steady hand is required (no rulers allowed), and that takes practice. Drawing a good freehand line comes in handy when you’re drawing plaids, adding great-looking hair, and penciling in lines of symmetry. 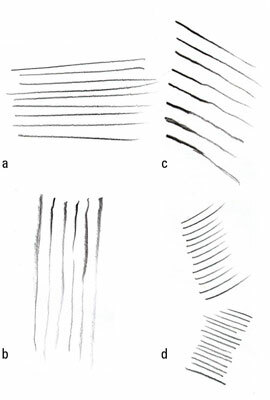 Lines of different widths and lengths are a must for creating texture in clothes, hair, and more. Draw some straight lines that go from thick to thin. Start by using the side of your pencil and then gradually turn it so the point creates a thin, wispy finish. With a bit of pressure from your hand, go really dark. Then ease the pressure on the pencil to lighten the line. You can achieve different looks by using different pencils and varying the pressure you apply with your hand. Curved lines definitely work in fashion illustration! You use curved lines when drawing hair, ruffles, an arched eyebrow, or a high-heeled pump, not to mention a million other things. Practice drawing curves in long loops bunched closed together as well as in arcs, and you see how useful curves can be in creating fashion clothes and hair. 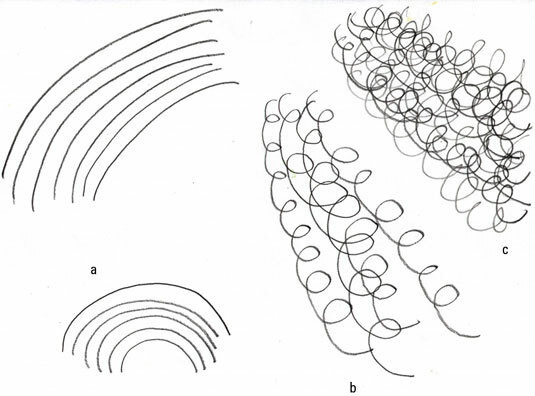 For example, you often use parallel curves when drawing necklines, waistbands, and cuffs. Practice drawing curves of different lengths and curvatures. Draw curves in long loops. Draw curves in tight bunches.